Follow this guide to learn everything you need to know about the FIFA 16 Ultimate Team Winter Upgrades. Q: How are players upgraded on FIFA 16 Ultimate Team? A: Different to what happens on other game modes, the players aren’t automatically updated throughout the season according to their appearances in real life. Some may receive In Form cards, but most players remain with the characteristics they were given at the start of the season. In Ultimate Team, upgrades are made through the release of new cards in determined periods. Q: When is it upgrade season on FIFA 16? A: There are two upgrade seasons throughout the game: Summer and Winter upgrades. The first one happens within the transition of one FIFA to another looking to reflect the player’s evolution between two seasons. The second one, in February, rewards the players who stood out the most along the first half of the season with the release of new (improved) cards. Q: What happens exactly if a player receives a Winter upgrade? A: When a player is upgraded, the cards that start coming in packs have got the new ratings and attributes according to their performance on the real life pitch. Q: If I have a card of a player that is to receive an upgrade, will this card get upgraded? A: No. It remains exactly the same, with the original rating and attributes that were defined initially in the game. Q: Can a player change categories if he is upgraded enough for that to happen? A: Yes. As long as the upgrade gives him enough points for that, a player’s NIF card can go from bronze to silver or from silver to gold. The IF cards never change category, though. Q: If I have an In Form card of a player that is to receive an upgrade, will this card get upgraded? A: Depends. Different to what happens with the NIF cards, the IF cards released before the upgrades will be upgraded in the same proportion as those (but automatically) if an upgraded player’s new OVR rating equals or surpasses his existing first in-form’s rating. Q: Why are there some In Form cards that didn’t receive an upgrade although their NIF did? A: First because probably the upgraded player’s new OVR rating does not equal or surpass his existing in-form’s rating. If it does, then it is because the upgraded player with an existing IF gets upgraded across Quality tiers (eg. Silver to Gold). In these cases, his lower-quality IF will not get an upgrade. (Ex: Jack Butland’s item is now Gold, but his Silver In-Form will not receive an upgrade and stays Silver). Q: What’s the reason for there to be this exception? A: According to EA, this is so “the IF card’s value and bronze/silver squads are not negatively affected”. The goal is to preserve the in-form’s high value. Q: Why wasn’t a certain player’s IF card upgraded if his NIF and UP were of the same category? A: Probably because that IF card already had the maximum rating for its category: 64 or 74. Q: All this is still a bit confusing. Can you explain everything again with examples? A: Sure. Let’s take Aguero as example. He started the season with an 87 rating but in Winter Upgrades he got an 88 rated UP card. His 87 rated card stopped coming in packs as soon as the 88 rated one was released, but his owners were never rewarded with any upgrade at all because that’s only valid for IF cards. Since Aguero already had two IF cards as from that day, respectively rated 88 and 89, and since new OVR rating equals his existing first in-form’s rating, these were automatically upgraded to 89 and 90, which corresponded to the point upgrade his regular card received. Any potential future IF card will be rated over 90. For IF cards, the upgrades are a bit more complex, specially if players are silver or bronze. Let’s look to the Dele Alli’s case. His regular card was upgraded by 5 points, going from 67 to 72. Since both NIF and UP cards are silver, his IF was also upgraded but not in 5 points because it would mean going to the upper category. Jack Butland’s case is the perfect example. He received a 5 points upgrade, which made him go from silver (74) to gold (79). Since his NIF card and UP card are of different categories, his lower IF card was not upgraded at all, remaining at 74. However his other IF card was upgraded by one point, which is the difference between the UP and the IF card. Q: Can there be two regular cards of the same player with different ratings? A: Yes. That’s what happens when a player receives an upgrade, two cards start coexisting: one corresponds to the start of the season and the other has got improved ratings and attributes. Q: When there’s an upgrade, which cards are the ones that come in packs? A: The new ones. The improved cards take place over the original ones in packs, and those remain as they were. Q: When EA will release the new cards? A: They do it every Friday of February. Q: Which cards are released first: transfers or upgrades? Q: Do all upgraded players get a new card? A: Yes. Although, if you own a regular card of a player that was upgraded there won’t be any alterations. Q: The NIF and TOTW cards are the only ones to be upgraded? A: No. Every single IF card has the chance to be upgraded, which includes for example the Heroes and Record Breaker cards. Q: How many players receive new cards during the FIFA 16 Ultimate Team Winter upgrades? A: Around 400 players items will see upgrades which is much more than in previous years. Q: When were the upgraded players made available back on previous years? A: At February 14 and February 15. Q: Where can I find a complete list of FIFA 15 Ultimate Team Winter Upgrades? Q: Where can I find a complete list of FIFA 16 Ultimate Team Winter Upgrades? Q: What players will receive upgraded cards? A: These ones for sure. Q: How can I predict which players have good chances of receiving an upgrade card? A: Even if you don’t keep up much with the real life football, there are two indicators to help out in this prediction: the number of a player’s IF cards; constant rating upgrades on H2H. Q: How do player upgrade cards look like? A: They are the same regular cards as those on the image below. Q: What’s the difference between the original card and the new one? A: Only rating and stats change. In some cases the position can also be updated. All the rest remains the same. Q: Can there be downgrades? A: The players’ ratings and stats are only looked at to be lowered between one FIFA to another. During the Winter upgrades, no player is downgraded. Q: How many points are the players upgraded by normally? A: For most gold players the upgrade is of just 1 or 2 points. Silver and bronze players are usually upgraded by at least 4 points, while in exceptional cases this upgrade can sometimes reach 15 points. Q: Do the player’s upgraded stats increase proportionally? Q: Can I have both the original and the new card in my club? A: Yes. However, a squad can only have one of them. Q: Can a transferred player receive an upgraded card? A: Yes, he can. Although EA Sports try separating player transfers/player upgrades, there are rare cases in which the same player is both transferred and upgraded at the same time. In that case both situations are passed on to one single card. Q: What advantage do the FIFA 16 Ultimate Team upgrades bring us? A: The upgrades increase the squads’ quality level, diminishing the differences between the game and real life football. Besides, they can also represent good trading opportunities, mainly when it comes to IF cards. Q: I already have a squad. What is it good to me? A: If you’re already “done” with your squad, the upgrades increase your improvement opportunities. If your squad is based on a league, for example, upgrades can improve the players you already have or they can promote others for a position or two. Q: How does the market behave with these new cards coming? A: As we would expect, as soon as the UP cards are released their price stays fixed way above the regular ones. These, on the other hand, start their way down. Also, with time the UP cards lose value once their quantity starts being superior to the rest of the cards. The price difference between the UP card initially and the regular card depends on many factors, such as the number of rating points gained, stats bonuses or an eventual position change. 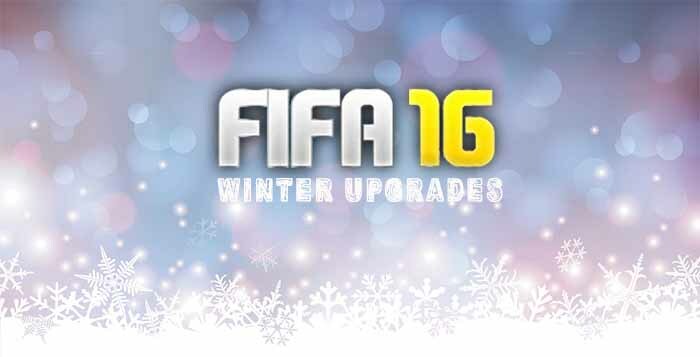 Q: Are there other trading opportunities during the FIFA 16 Winter upgrades? A: Yes. When the player already has at least one IF card, this card is improved in the same proportion as the regular. There are people who choose the risk to invest in IF cards of players that have good chances of receiving an UP in advance because they know that in case that happens the return will be enormous. The bigger the player’s rating and popularity, the bigger is the IF card’s valorization. In some cases profit can surpass 300%. At a long run, these cards follow a tendency we describe for a normal IF: the cheapest ones lose value, while the most expensive ones slowly have their price increased. If you’re thinking about investing in these cards, be careful not to bet on the cards that are already being way too speculated. It’s just that sometimes the speculation is so big around determined cards that, after the upgrades, the improved IF cards’ market prices are inferior to what they were before the announcement. On the other hand, if you have a NIF of a player you think is going to receive an upgrade, it may be a good idea to sell him in advance so you minimize the loss. Q: Why there are upgraded IF cards which prices raise and others don’t? A: There are many reasons to explain it like the upgrade foreseeability (the more predictable is the upgrade, the more speculation there is and lower the rise after upgrade will be), the overall ratings (the bigger is the rating, more rare and expensive the cards are) or the league, club and nationality popularity. Q: What cares should I take with these new cards coming? A: If you want to buy a NIF, make sure you’re not paying the price the UP demands. If you want to sell an UP, make sure you’re not selling for the corresponding NIF price. Q: Where can I find more information about these cards? I want to ask you , i have a 85 rated petr cech card that played 200 games now , i’m thinking of buying the UP Card but does the record disappear once that happens ? Or does it continue to count ? It disappears because it is another card. Does skill upgrades coming later or has it been a skill upgrade? This year, EA didn’t provide any detail about skills upgrades. Do you know whats happining with west ham Emenike card? Its been nearly 2 weeks since he moved to BPL, card still not in Fifa. EA can’t create new players in the middle of the season. Emenike was playing in a non licensed club and for that reason he will not be included in the game. Hi Rodrigo. What are your thoughts on Jonas? Now he has a 82 rated card. Do you think he is getting an upgrade of 1 or 2 points? In that case his 85 rated IF card will be 86 or 87, right? Are you saying that his highest IF rated card will get more expensive after his possible update? I’m a Benfica supporter, so I know Jonas very well. For his age, he is an amazing player. I believe that he will be upgraded from 82 to 83, which means that all the three IF cards will also be upgraded 1 point. His highest IF rated card will get more expensive but only if people are not rising his price already. Thanks for your reaction! I’m curious to see what’s going to happen. Keep up the good work with this website! We believe that they will not implemented on Android but we have no confirmation about it.